Home Church News Sermon Notes Does It Matter? This Sunday, we welcome a guest speaker! Rev. Lilia Maria Ramirez-Jimenez is a United Methodist missionary serving congregations in the United States. A native of Colombia, Rev. 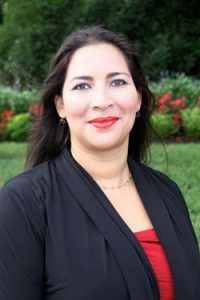 Ramirez-Jimenez has served congregations in New Jersey and was coordinator of the Office of Specialized Theological Education at the United Methodist General Board of Higher Education and Ministry. Read her full bio here. Sunday’s time of worship will include time for Rev. Ramirez-Jimenez to report on her work as a missionary, but also to bring a message of God’s love and radical inclusion. 25Therefore, after you have gotten rid of lying, Each of you must tell the truth to your neighbor because we are parts of each other in the same body. 26Be angry without sinning. Don’t let the sun set on your anger. 27Don’t provide an opportunity for the devil. 28Thieves should no longer steal. Instead, they should go to work, using their hands to do good so that they will have something to share with whoever is in need. 29Don’t let any foul words come out of your mouth. Only say what is helpful when it is needed for building up the community so that it benefits those who hear what you say. 30Don’t make the Holy Spirit of God unhappy—you were sealed by him for the day of redemption. 31Put aside all bitterness, losing your temper, anger, shouting, and slander, along with every other evil. 32Be kind, compassionate, and forgiving to each other, in the same way God forgave you in Christ. 1Therefore, imitate God like dearly loved children. 2Live your life with love, following the example of Christ, who loved us and gave himself for us. He was a sacrificial offering that smelled sweet to God. Paul reminds us that we’re connected (“we are parts of each other in the same body” in v25). Where has that broken down in our church, our communities, our country, our world? Where might God’s love be most needed in our church, our communities, our country, our world? In what way can you follow the example of Christ and live your life as God’s love? What would that take to achieve? What would it change for you and for those who know you?